For solar energy businesses in the United States, it’s been a time of uncertainty and the new tariffs imposed by President Donald Trump’s administration are just part of a story about challenges. 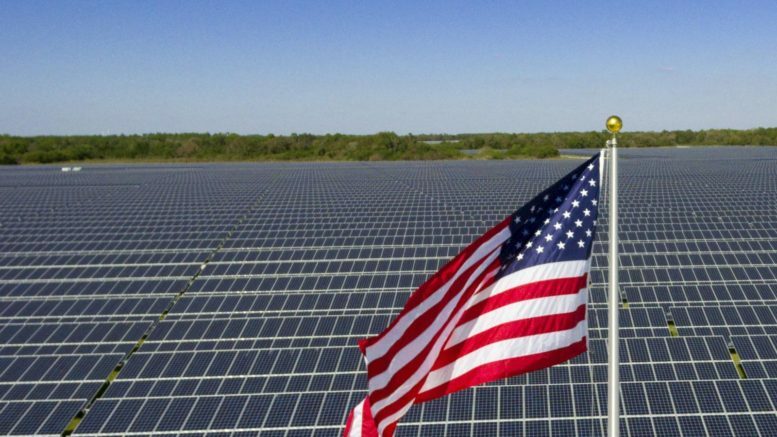 Those tariffs – up to 30 percent on some imported panels – were meant to create a more level playing field for America’s solar industry, which saw many U.S. companies fold in a climate that made competition hard. While there’s been much debate about who really gets hurt by the “protective” tariffs, most analysts argue the answer is American firms because of their reliance on imported panels in the sector. Yet the enactment of the tariffs is just one consideration in developments affecting the USD$28 billion market. As industry leaders gather in San Diego for the annual Solar Summit 2018, they’re looking at the impacts of the Section 201 tariffs but also trends, such as the industry’s coupling with solar energy storage, that may translate to new opportunities and deliver turnaround to a solar sector that’s shed too many jobs. The Solar Foundation released its annual report in March, and it showed a loss of just under 10,000 solar-employment positions for an industry that supports about a quarter-million jobs. That’s about 3.8 percent, with concentrated decreases in California and Massachusetts. Yet employment was up in 29 states and the District of Columbia, which shows a lot of promise in states with still-emerging markets. “There’s much to be optimistic about in American solar, and while there’s no question the tariffs have some impacts for many installation and service providers that rely on imported panels, there are other factors creating new opportunities,” said Dan Kennedy, chief at Colorado-based Outdoor Solar Store. They may well begin in Colorado, where Gov. John Hickenlooper signed legislation in March that allows consumers full rights to use and store their solar energy. The bill, according to a Colorado legislature summary, gives electricity consumers the right to “install, interconnect and use energy storage systems on their property,” leading to a safer, more reliable, less costly and more efficient electric power grid. It makes solar a more attractive investment for residents and companies, notably perhaps with the exception of the utility providers themselves, while bolstering confidence in the flagging solar industry. It’s also an illustration of how cities, states and other governments are succeeding in the pushback against Washington, and the Trump administration reversal of renewable energy adoption in the U.S.
That’s where Kennedy and others see cause for optimism, as governors and mayors partner with the private sector to build a clean-energy future – because, above all, it’s now more cost effective to choose. In fact, people like Borrego Solar CEO Mike Hall think that Trump’s tariff decision has pushed regional leaders toward action on renewables and focused attention on legislation to support solar and wind. “There are a lot of great bills moving through mostly blue states,” Hall told PV Magazine. “We see a lot of states saying – how do we get middle markets growing, how do we get solar into the built environment.” New Jersey just passed favorable new laws, for example, while South Carolina did not. Private industry demands also are changing the solar landscape. In late March, Microsoft announced contracts for 315 megawatts of solar power in what is the single largest corporate purchase in the history of the United States. Businesses are driving solar for compelling reasons, not the least of which are their customers’ expectations, and corporate solar grew 28 percent year over year in 2017 even under challenging conditions. That’s only expected to continue as the private sector chooses solar. In some cases, the current market conditions haven’t completely shut down projects, but have led companies to delay what’s in the pipeline and shifted their timelines into 2019 and beyond. It too reflects the sense that this is a temporary moment but realistic clean energy goals are permanent. That means there’s room for American jobs and solar-business growth, despite the years of competitive disadvantage as heavily subsidized Chinese panels flooded the market, and then the U.S. decision to walk back its clean-energy environmental commitments on the global as well as national stage. There aren’t yet a lot of new manufacturing announcements, apart from JinkoSolar’s existing plans for a new facility in Florida announced in January. Some companies, at least initially, even put expansion plans on hold, but they can’t really put the inevitability of a renewable energy future on pause forever. 1 Comment on "Future trends for U.S. solar industry"
The development of the solar energy industry is a very important step for US and the whole of mankind. We must provide all our resource into this industry, because the energy of sun is ecological! Atomic energy harms the planet, remember Chernobyl and Japan. The extraction of fuel also harms environment. The energy of the sun is pure, natural energy. The whole world should start using it!